The Gorgon Project’s subsea gathering system – in place at one of the world’s largest natural gas projects, located off the northwest coast of Western Australia – is the largest ever installed in Australia. And its completion paved the way for the production and transport of natural gas from both the Gorgon and Jansz-lo fields to the liquefied natural gas (LNG) plant on Barrow Island. A subsea gathering system has structures called trees to contain and control the production wells at the fields. The produced gas from the wells is gathered at several subsea structures installed at each field and transported via pipelines to Barrow Island. 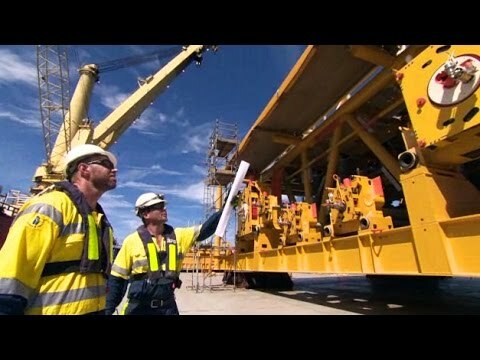 The installation of the subsea gathering system entailed overcoming unique technical challenges that stretched industry capability. The state-of-the-art system is one of the world’s deepest and longest subsea gas production and gathering systems. Extremes in gas flow conditions, water depth, distance and the natural environment tested the practical limits of design and construction. In addition, the system had to be reliable enough to support a plant that feeds three 5.2 million-metric-tons-per-year LNG trains on Barrow Island, with a design life of 50 years. The Gorgon Project’s subsea gas gathering system is the largest ever installed in Australia and features state-of-the-art infrastructure. The subsea gathering system’s infrastructure incorporates corrosion-resistant alloy in-field pipelines and specially developed management techniques for the main production pipelines. Many components required for the system were beyond the limits of prior industry experience and were specifically created and qualified for Gorgon. This design model was developed for the Gorgon subsea gas production and gathering systems – to connect two gas fields to the LNG plant on Barrow Island. The system consists of 18 wells, 20 subsea structure elements, 63 spools, about 500 miles of pipeline and associated infrastructure. Some structures weigh more than 1,000 metric tons, are positioned in a 15-foot (5-meter) circle about 4,500 feet (1,350 m) deep, and required a special lowering system for deployment. All subsea connections were built using remote operated vehicles. The photo shows a remote operated vehicle preparing the first subsea tree for gas to flow to the plant site. The project’s 63 tie-in spools were fabricated onshore after subsea measurement with an accuracy of within 50 millimeters – tricky given that some spools are longer than 330 feet. Connecting the pipeline from the field to the LNG plant required a “super span” that acts like a cable, enabling the team to bridge a 70-degree subsea escarpment that is almost a sheer cliff. A control umbilical provides power to the subsea facilities. More than 1.7 million metric tons of rock was required to stabilize the umbilical and pipelines, in case of a cyclonic event. The Gorgon team managed the technical challenges of developing the subsea gathering system through engineering practices, such as an intensive research and qualification program. After moving into the front-end engineering design stage in 2005, the concept matured to a diver-less system built by remote-operated vehicles with multiple drill centers. The design incorporated the flexibility to shut in without impacting adjacent production, the option to enable future field tie-ins and a provision for future compression platforms. To transport gas from the two fields to Barrow Island required some 500 miles (800 km) of offshore pipeline, including about 125 miles (200 km) of main production pipeline. Accessing the Jansz-Io field demanded a high level of innovation to resolve an evolving suite of significant engineering challenges. It required crossing a very steep slope known as an escarpment or scarp in about 1,640 feet (500 m) of water at the top, down to a water depth of almost 2,500 feet (750 m). Typically allowable span lengths for subsea pipelines are around 131 feet (40 m). However the steepness of the seabed profiles at the scarp crossing resulted in pipeline-free spans up to 885 feet (270 m) in length. In 2014, the Jansz-Io Subsea Pipeline Scarp Crossing won the “innovation and development” category at both the Western Australian and the National Engineering Excellence Awards - two of numerous accolades received by the Gorgon Project during its construction. These awards capped almost 10 years of detailed research, planning and final execution of the Jansz-Io pipeline and scarp crossing. The concepts and methods developed will provide the enabling technology for future deepwater pipeline projects. The Gorgon Project is located on Barrow Island about 37 miles (60 km) off the northwest coast of Western Australia. Gorgon’s first train achieved first gas earlier on March 7, 2016 and the second train achieved first gas on October 25. On December 9, Gorgon began domestic gas supplies to the Western Australian market.